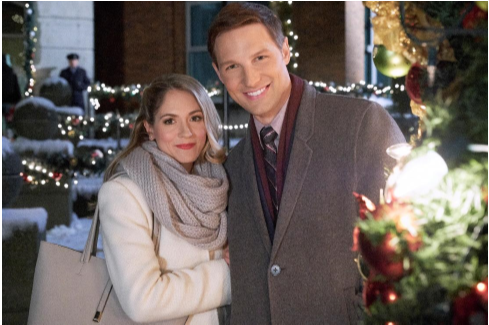 STUDIO CITY, CA – November 9, 2018 – Brooke Nevin (“Chicago Hope,” “The Christmas Cure”), Michael Cassidy (“The OC”) star in “Jingle Around the Clock,” a new, original movie premiering Saturday, December 22, (8 p.m. ET/PT) on Hallmark Channel as part of the network’s #1-rated programming event, COUNTDOWN TO CHRISTMAS. Hallmark Channel is historically the #1 television network in all of Q4. Elle Bennett (Nevin) is an ambitious ad agency executive in Chicago who is looking forward to putting together her annual “Misfit Christmas” party with her close friends – a holiday tradition since their college days which is clearly important to her. However, difficulties at work put a kink in her plans, drawing her back to the office, where she discovers the company is bringing in another executive, Max Turner (Cassidy) from the New York office to solve the problem. Concerned this new guy who she knows only from emails might put a damper on her plans for a promotion, Elle re-doubles her efforts at work, putting her Christmas party plans at risk. Despite her best effort to take control of the work situation, Elle’s boss asks her to work with Max and when they finally meet, she realizes he’s also the attractive stranger who started showing up at her local coffee house a few days ago. Despite the mutual attraction, things take an awkward turn when Elle realizes Max intends to stay in Chicago and apply for the same job she’s been angling for; the fact that he’s doing it so he can be closer to his mother who Elle knows makes it even harder to be upset. As the big day of their interviews approaches the two become friends and decide to let the better person win the job, but Max has other plans, which first leave Elle feeling heartbroken and betrayed, but ultimately leads to possibly the best Christmas ever. “Jingle Around the clock” is from Lighthouse Pictures Inc. Kristofer McNeeley and Brooke Nevin are executive producers. Shawn Williamson, Jamie Goehring and Johnny MacCarthy are producers. Paul Ziller directed from a script by Joie Botkin and Zac Hug.